Maintaining your lawn and garden is no easy task; even the smallest amount of neglect can amount to a great loss in the growth of your garden. You want to ensure that all the steps have been taken and you have a beautiful flowing garden at the end of your hard work. 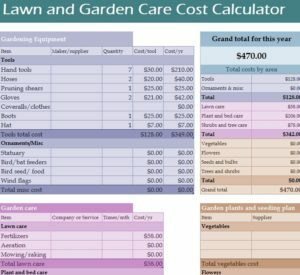 The Lawn and Garden Care Cost Calculator is the perfect way to tend to your garden and make sure that you never go over budget at the same time. This free template document is your way to quickly enter the items that you need to maintain your garden and the document automatically calculates totals for you. Whether you’re buying soil or new tools for your garden, this template has the tools to help you save. Downloading this document is simple, just follow the link at the bottom of this template and continue to the guide listed below. Start by filling out the information you need about the equipment you use for your garden or lawn in the blue table at the top of the page. This is just a space that you will list tools that you commonly use their price along with it. Once you finish entering that information, you can move on to the garden care section, this if for listening soil and other items like that to care for your lawn or garden. The final brown table is for listing different seeds that your buy or other plants as well. This table will not be used as frequently. The table at the very top of the page will list out all the expenses that you have entered in the document below and calculate their totals for you immediately as you enter the amounts. You can maintain your garden for a reasonable price, using this free template.